President Reuven Rivlin turns down former IDF Sargent Elor Azariya's request for clemency for shooting death of Arab terrorist. President Reuven Rivlin will not grant former IDF Sergeant Elor Azariya a presidential pardon, it was announced Sunday evening, despite the recommendation by Defense Minister Avigdor Liberman. 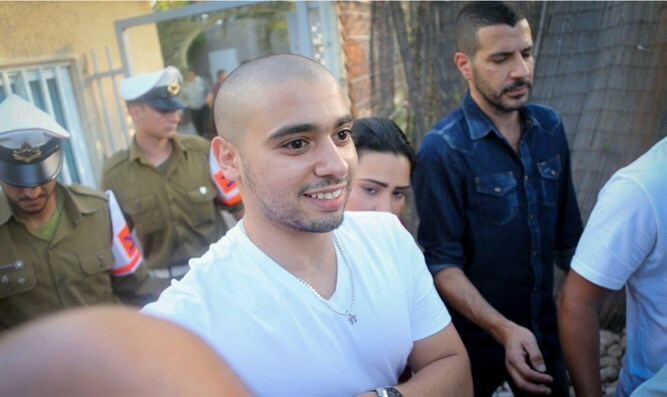 Azariya, who was convicted in January for the March 2016 shooting death of an Arab terrorist shortly after a stabbing attack on an IDF soldier in Hevron, was sentenced in February to 18 months in prison. In September, IDF Chief of Staff Gadi Eizenkot slashed four months from Azariya’s sentence, following a written appeal on Azariya’s behalf. The former soldier’s legal defense team later submitted a pardon request to President Rivlin, after Azariya began serving his sentence this August. While Defense Minister Avigdor Liberman backed Azariya’s clemency request earlier this month, on Sunday, President Rivlin publicized his decision not to issue a pardon. The President’s Office released Rivlin’s written response turning down Azariya’s request Sunday. “From examining the material before him, the President learned that in passing sentence, the military court took into account the circumstances raised by you - which appear in part in this pardon request - as consideration of leniency, and noted it took them into account in passing a lighter sentence. “In addition, in September 2017, the Chief of Staff saw fit to further ease your sentence and reduce the punishment by four months from the prison sentence imposed upon you, for reasons of compassion and while taking into consideration your military service as a soldier in the operational arena. “As such, the President concluded that taking all considerations into account and in light of the above, an additional lightening of your sentence would harm the resilience to the Israel Defense Forces and the State of Israel. The values of the Israel Defense Forces, and among them the Purity of Arms, are the core foundation of the strength of the Israel Defense Forces, and have always stood strong for us in the just struggle for our right to a safe, national home, and in the building a robust society.